‘At the beginning of the world Einigan the Giant, the Welsh Adam, witnessed the three descending rays of light that brought the world into being. In those rays of light was all the knowledge that ever was or would be, and Einigan, beholding them understood some of that knowledge. In order to preserve what he had learned, he took three long straight branches of a rowan tree, cut them into staves, and carved the first of all letters on them.’ The Coelbren Alphabet’. John Michael Greer. The greater part of Bwlch Corrog site is overgrown with molinia grass, the result of seven years relief from grazing. Here and there a few brave trees emerge from the dense clumps, birch and hawthorn but mostly rowan. Hardy and graceful rowan seems to succeed where others fail. It loves high altitudes and tolerates acidic soils. Its presence provides shelter for other tree species which will eventually dwarf the little rowan which only reaches heights of about 10-15m. So like birch it is a pioneer, opening the way for future tree settlers. It’s liking for mountains and its feathery multi-stemmed leaves have led to its alternative name: mountain ash, though it is not of the ash family but of the rose, along with hawthorn, cherry and apple. Like its cousins its seeds are contained inside fruit. These abundant and beautifully bright red berries are an irresistible and invaluable food source for birds such as blackbirds, mistle thrush, redstart, redwing, song thrush, fieldfare and waxwing. Inside the birds stomach the seeds are stripped of their protective coating enabling germination as the birds inadvertently distribute the seeds far and wide. Thus, our high elevations are thriving with new rowan saplings. In May rowan is decked in fragrant, creamy white blossom, a feast for bees, butterflies and wasps and an uplifting sight to the weary traveller, urging him to persist in his endeavours to reach his goals, physically and metaphysically. Deer enjoy the lichen, bark and foliage of rowan and the leaves are food for caterpillars of moths including the Welsh wave and autumn green carpet. Caterpillars of the apple fruit moth feed on the berries. Indeed, when cooked the berries are highly nutritious to humans containing the ‘sustaining virtues of 9 meals’. They may be made into jellies and jams, used in pies, mixed with apple to make wine and here in Wales are brewed into a fine ale. They are thought to aid healing and there is a folk belief that to consume rowan berries adds a year to a person’s life. Its other names are ruan which means tree and quicken from Cwic which is the Anglo Saxon word for alive. This association is echoed in the Greek legend of Hebe, the goddess of youth who had the power to make the old young again. Hebe was cup bearer to the gods. However, one of the cups was stolen by demons and her father Zeus sent an eagle to recover it. During the battle that followed wherever a feather or a drop of blood fell a rowan tree grew, sporting feathery leaves and blood red berries. Another of rowans names; Witch Wood or Witchen, signals rowans magical associations. It is thought to aid the flow of energy in the earth, guarding the ley or dragon lines and power centres. Perhaps the silver, grey bark and flame red berries deepen this dragon association. The druids of old planted rowan at stone circles and other significant sites, considering it indispensable to the wellbeing of the land and symbolic of the hidden mysteries in nature. Connecting with rowan can help to activate your own energy body bringing vitality and healing and awakening psychic abilities. It’s varied seasons of fruit and blossom represent the different faces of nature and helps us balance and harmonise our physical, mental, emotional and spiritual aspects. 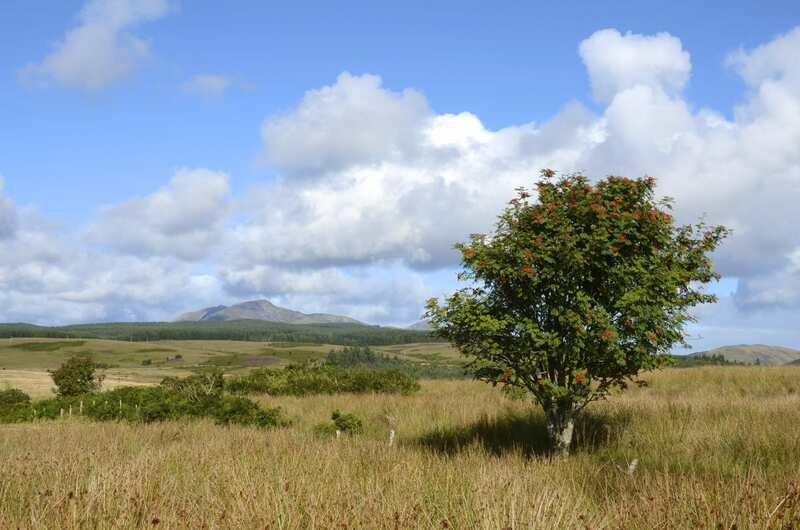 Rowan is particularly abundant in the Sottish Highlands and the rowan that grows on the Isle of Arran is the true genus, not a hybrid. Arran was considered by the Irish Celts to be a physical manifestation of the Otherworld and thus rowan is linked with the Lord of the Hunt, in Wales known as Gwynn ap Nudd. Its gentle, protective shading of young saplings, presence on energy lines and the fact that it has a tiny five-pointed star or pentagram on each of its berries lend it a benevolent reputation. It is thought to protect the property on which it grows and there is a folk custom of sprigs or equal sided crosses made of rowan being sewn into coats, carried in a pocket or fastened to cattle. Milksheds were decked with rowan, an association also reflected in rowans connection to Brigid the Great Mother and patroness of poetry, smithwork, healing, agriculture, weaving and spinning. Interestingly rowan has traditionally been used to make spindles and spinning wheels as well as walking sticks and tool handles. The bark and berries have been used to make a black dye and the bark was at one time used in the tanning process. In Scandinavia there is a belief that rowans growing in inaccessible, high up clefts possess an even more powerful magic and are called ‘flying rowan’ and in Iceland there is a myth that at winter solstice the rowan is blessed by the stars as it’s downy buds sparkle with frost. It is an early representation of the sky goddess, and people decorated trees, plants and poles with lights and fruit to celebrate the light in the darkest time of year. A crescent moon shone at the top of the shining rowan tree. Later glittering objects were used, and a special star replaced the moon atop the crown of the tree. This symbol was later incorporated into Christianity with the star representing the birth of Jesus, bringer of the light on the day when the sun is visibly higher in the sky. So, a visit to Bwlch Corrog cannot fail to include views of lovely young rowan trees. Perhaps while you are there you will wear a sprig to protect you from being transported to the land of faery? Or you may like to contact the inspirational muse of rowan by taking the berries to where the land meets the water?